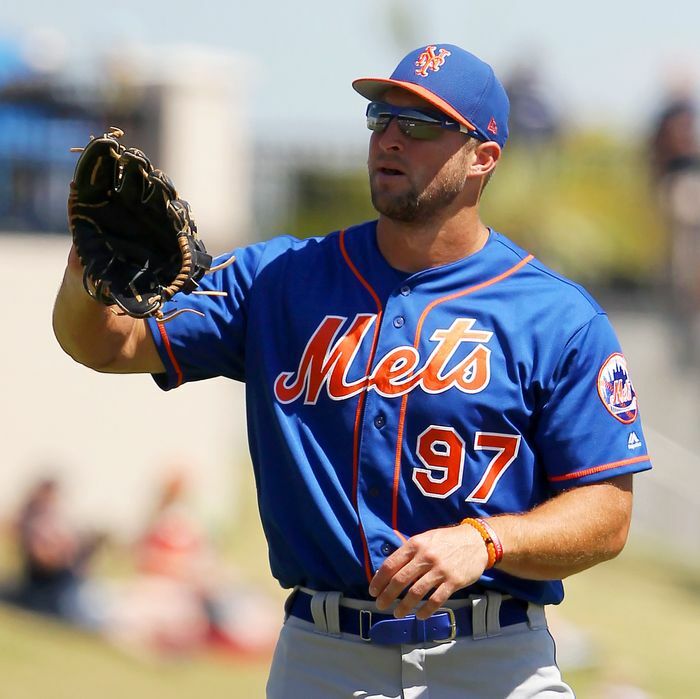 In search of divine intervention, the Mets may soon promote Tim Tebow from the club’s Class A Columbia Fireflies, the Post reported Friday. The Heisman-winning NFL flameout has enjoyed a bit of a hot streak in the past couple weeks, with an OPS of .849 over 16 games. It “hasn’t gone unnoticed by team officials,” the Post says, and the team is considering challenging him at a higher level, though not the majors. Not yet, at least. For Tebow, that would mean an increase in the quality of competition, along with older opponents. If he’s bumped up the Mets’ High A affiliate in Port St. Lucie, Tebow would be playing largely against 22-year-olds. If the team’s AA affiliate, the Binghamton Rumble Ponies, is his destination, Tebow will be competing largely against 24-year-olds. Tebow, who is currently six years older than the next-oldest position players on the Fireflies, will be 30 in August. Even though the Mets are toying with a promotion, Tebow’s performance hasn’t been much to get excited about. When the team signed him, he was supposed to be a slugger, if nothing else. He even homered in his first at-bat. But in 109 plate appearances since, he’s hit exactly one more homer while slugging .370 — not quite what you expect from a guy with biceps that look like the Home Run Apple. With that negativity out of the way, it’s worth noting that Tebow’s baseball experiment has been a success. It has kept him in the news for his athletic pursuits, which was no longer happening with football. And at a time when ESPN is axing dozens and dozens of employees, he just re-upped with the ESPN-owned SEC Network. As Deadspin notes, Tebow’s baseball career “was coldly conceived as a way to keep him famous.” Despite his middling performance on the field, it’s doing exactly that. And the saintly Tebow might present the Mets with an opportunity as their season teeters on the edge of collapse: Call him up to Queens to minister to Matt Harvey.